With the Lumia Camera app for Microsoft’s Windows Phones, your snaps are finally... snappy. We’ve been hoping to play with the Lumia Camera app ever since Microsoft showed it off earlier this month in advance of the Windows 10 event in Redmond, Wash. Lumia Camera is just one component of the Lumia “Denim” upgrade, which brings Windows Phone 8.1 Update to Windows Phones. Denim also includes a firmware upgrade—and in some specific phones, including the Lumia 930, Icon, 1520, and the Lumia 830—the Lumia Camera app. It’s more than a bit confusing, and as Microsoft moves its phones on to Windows 10, we hope it can simplify its message. As simple and powerful as the Lumia camera apps can be, there are seemingly dozens of dedicated apps, each bringing dedicated feature sets to the table. Even Lumia Camera is simply the “new” version of an app that debuted a while back. 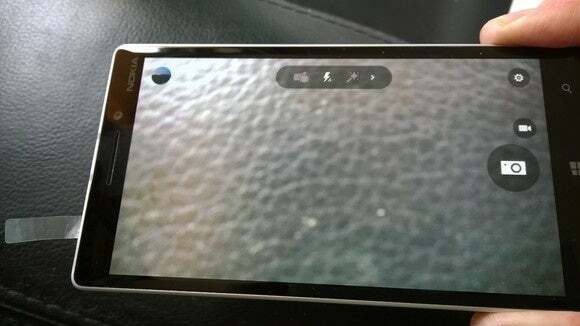 The Lumia Camera has a simplified interface; note the lack of the burst shooting mode at right, as well as the "wand" icon at top for the Rich Capture mode. What Denim and Lumia Camera promise is that with a little practice, you’ll never miss a shot. Lumia Camera loads and shoots extremely fast, solving a notable problem with the Lumia smartphones. 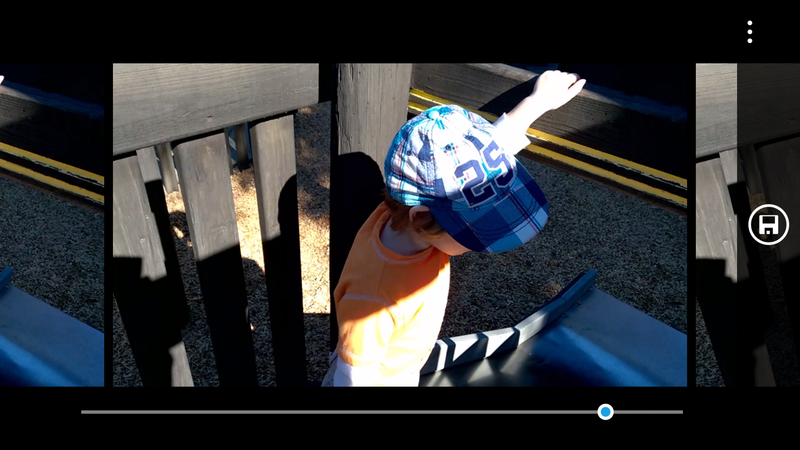 Moment Capture (now called Lumia Moments) allows you to extract images from video quickly and easily. Finally, Rich Capture lets you adjust the exposure—after you’ve taken the shot. Microsoft loaned us a Lumia 830 for testing. It included the Lumia Camera app and the new features—including the “Hey Cortana” passive listening feature, which we also put through its paces. With the Lumia 930, Denim, and Lumia Camera, that “cold shot” time dropped to about four seconds. That’s a significant difference, especially if you’re trying to grab your camera for a quick picture. Most kids are constantly in motion. 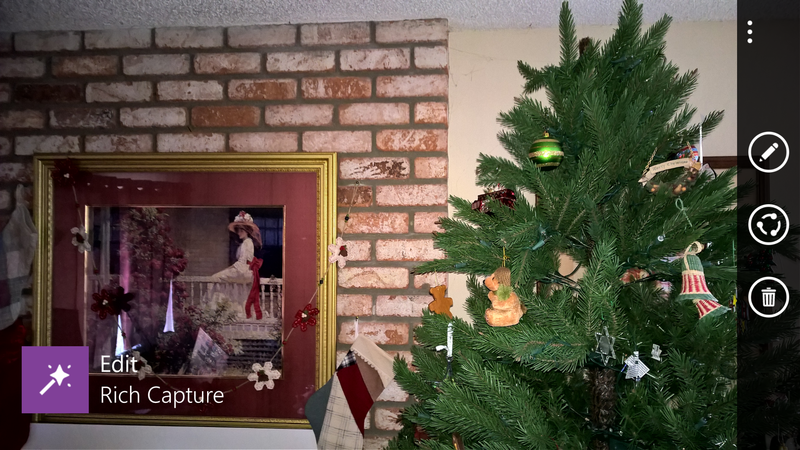 Lumia Camera makes it easy to take a quick shot. Static picture times and shot-to-shot times have also improved. In part, that’s because the Lumia Camera app constantly autofocuses the lens. Older Lumias also snap pictures almost instantaneously—but only if you prime the pump, so to speak, focusing the camera before taking a picture by tapping the screen. Otherwise, it takes more than two seconds. Whipping a Lumia Camera phone around, then taking a photo, cuts that to less than a second. And if you hold the camera still, the camera takes the photo almost immediately. With the older 1520, tapping the shutter button repeatedly required about two seconds between each shot. With Microsoft’s Lumia 930, I snapped about three every two seconds. Older Lumias “cheated” by offering a burst mode option, where you could hold the camera and fire off ten exposures or so. The otherwise excellent Nokia Blink app also shoots a rapid burst of several exposures. With Lumia Camera, you can manually shoot frames at about two to three shots per second. 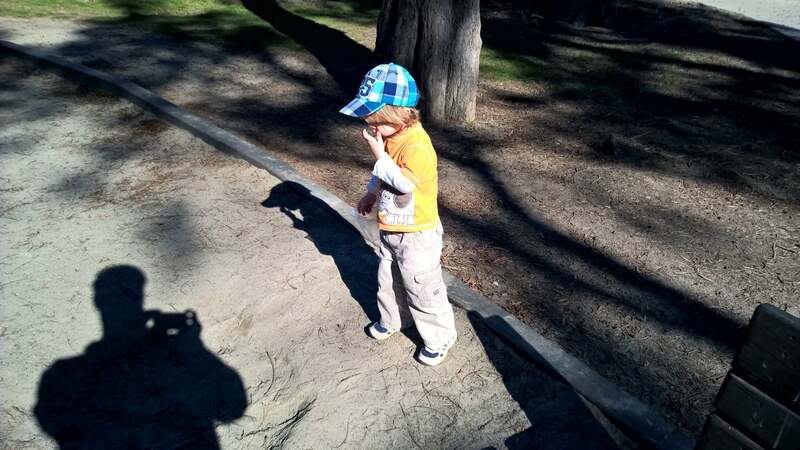 An even better alternative to burst mode is Lumia Moments (which Microsoft previously referred to as Moment Capture). The premise is simple: Each frame of a high-definition video is itself a high-quality photo. If you’re recording video, the thinking goes, you simply can’t miss the perfect shot. That’s not absolutely true, but it certainly increases the chance that you’ll capture that angle, glance, or perspective that can make for a great action photo. Lumia Camera treats each frame as an individual image; you can save them for later and also edit them. Naturally, your saved image is only as good as the video itself—videos I shot certainly had many, many frames that I’d discard. But what sets Moment Capture apart is that it frees you from documenting your life, and lets you enjoy it. Sure, you can post the whole video on Facebook. But instead of carefully framing each precise shot of your kids riding bikes, you can just point your Lumia in their general direction. If your camera sees it, so will your photo album. Note that you’ll need to open the video in the Lumia Moments app itself to extract the images; otherwise, it will just appear as a video. And in long videos, finding that perfect shot feels somewhat like searching for a needle in a haystack. Of course, one of the advantages of Lumia cameras is its extensive range of manual controls, which carry over from the older Nokia Camera. If you want to place the camera in a mount and take a long exposure of the night sky, you still can. But what shutterbugs will welcome most about Lumia Camera is the new Rich Capture tool. I never saw the appeal of 2011’s Lytro camera, if only because I thought that “focusing” after the picture was taken was an artistic choice few would make. (The Lumia Refocus app does something similar.) I feel differently about Rich Capture, Microsoft’s post-picture exposure tool, if only because it feels immensely practical. High-dynamic range photography takes photos at different exposures, then composites them together. (Apple’s Camera app has included HDR support since 2010’s iOS 4.1 update; Lumia cameras still rely on third-party apps.) Rich Capture has a similar technique, but uses the camera’s flash. To trigger Rich Capture, you must tap the “wand” icon at the top of the screen and make sure you have the flash enabled. Rich Capture will take at least two photos: one with the flash, and one without. You’ll have the option to open either photo, but don’t bother. Choose the third option, marked “Customize”. Rich Capture doesn't seem to be a distinct app. Once you take a shot with the Rich Capture ("wand" icon) enabled, tap the small picture bubble in the upper left of the display, then the picture itself. You can then edit using Rich Capture. While most photographers prefer shooting in natural light, conditions don’t always allow for perfect photos. And honestly, you’ll probably take better photos, period, by planning out how to frame and expose the shot. But Rich Capture seems like a good safety net, allowing you to highlight details with the flash without blowing out your subject. Our demo phone also included the “Hey Cortana” passive listening feature, which will eventually arrive on the Lumia Icon as well. Normally, Cortana is triggered either by a long press of the magnifying glass “search” icon, or else by triggering the Cortana app manually. Cortana has also been included in the Windows 10 technical preview, though it was found to be somewhat anemic at that time..
To enable “Hey Cortana,” you’ll need to turn it on in the Settings menu; I never saw any prompt that asked me to turn it on. Once enabled, you’ll need to train it by saying “Hey Cortana” to the phone about five times. I tried to vary my voice a bit, to allow for variations in tone and speech. But when I first began using it, Cortana seemed to recognize my efforts only every third try or so, with very little margin for error. Cortana also seemed to work best when the phone was at arm’s length; however, my Note 3 recognizes “OK Google” usually on the first try. I should note that once you have Cortana’s attention, the speech recognition works well—there’s none of the 1-nanosecond attention span Cortana does on Windows 10. I still feel like you need to learn Cortana’s “lingo” to interact with Microsoft’s digital assistant, however, while Google feels a bit more loosey-goosey and natural. (Try saying “Hey Cortana,” then “Help,” for a list of activities and the words to use.) As we detail in our other article, you can ask Cortana a question, schedule an appointment or reminder, or perform other activities. Interacting with other apps, however, can be a bit wonky. I asked her to play a particular song from my Xbox Music library, which worked just fine. But Cortana plays the song in the background; there’s no obvious way to pause the song, as there’s no pull-down notification and no app to access. You can orally ask Cortana to pause the music, though. Any convenience that “Hey Cortana” provides is currently short-changed by the lack of immediate recognition. Quite simply, it’s inconvenient to use. You’d be much better off using the mic icon or simply typing in what you want Cortana to do. All in all, however, what Microsoft offers as part of the Denim upgrade is amazing. Frankly, this feels like a very specialized OS release, rather than just a feature update. Just make sure that you have one of the supported phones—and no, the Lumia 1020 isn’t one of them. Otherwise, you’re going to be jealous.